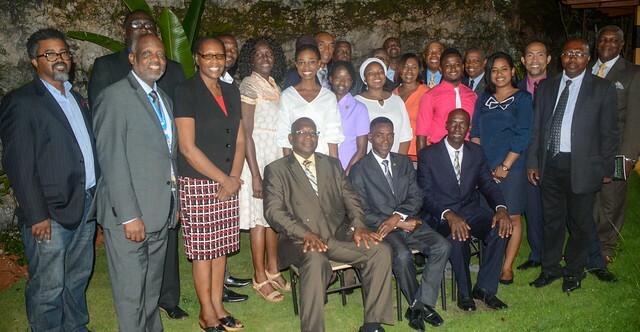 Members of the Northern Caribbean University Board join with NCU winners, among other guests for a group photo. Recently, the Board of Governors of Northern Caribbean University (NCU) had a mingle with some of the university’s outstanding students. Among these students were the winners of the International Business Model Competition (IBMC) – Baesc Tech, the winners of the Scientific Research Council’s National Science and Technology Fair – Pneulyfe, and representing the winning male Basketball team and female Netballs teams – Gibson Lafayette. 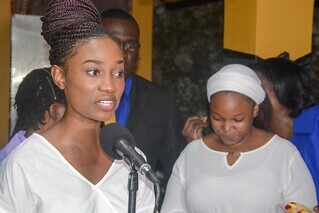 Above: SRC winner and Pneulyfe member, Tori Wallace, sharing her experience, in view of IBMC winners, BEASC Tech in the background. The students told the board members and other specially invited guests about their journey of success; the sleepless nights, the ups and downs, the sweat and tears. It was truly something to marvel as the guests stood in awe and excitement at what they heard. NCU’s President, Dr Lincoln Edwards, and the Chairman of the Board, Pastor Everett Brown, gave greetings. Mrs. Hazel O’Connor (IBMC coach) also added her remarks on the journey with the students. Overall, it was a light evening filled with heart-warming stories, music and laughter.